In June 2015 David Rudlin of URBED was asked to give a presentation to a meeting of the Wisbech 2020 group. During the presentation David drew on his winning entry for the Wolfson Economics Prize to talk about the issues faced by towns like Wisbech and the strategies that had been used elsewhere to bring about regeneration. 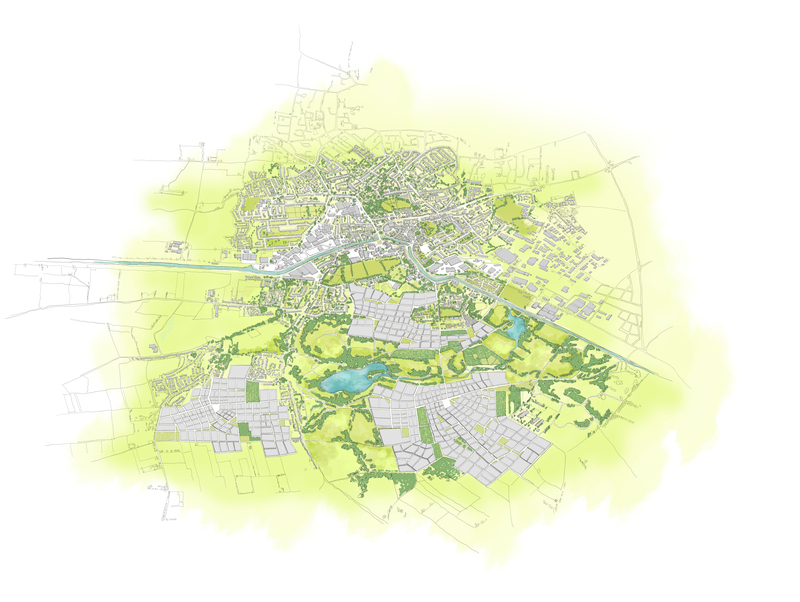 Subsequently, Fenland District Council and Cambridgeshire County Council together with Anglian Water and Foster Developments commissioned URBED to explore the Garden Town concept in more detail. The aim was to create a bold vision for Wisbech using the potential reopening of its railway as a spur to a radical regeneration of the town including significant house building. The starting point was to plan for an additional 10,000 homes in Wisbech in addition to the 3,550 allocated in the local plan. We have explored a range of options for how these new homes could be added to Wisbech, linked to the new rail connection putting the town within commuting distance of Cambridge and Peterborough. The Garden Town is a radical initiative to deal with this, to expand the population of the town, transform its housing offer, to help the existing community while attracting new people and investment. The presentation concluded with the suggestion that ‘great towns are not those that resist change but those that embrace it, that attract people, absorb and integrate them and use their energy as a force for regeneration’. For URBED this is an opportunity to explore the ideas that we put forward in our Wolfson Economics Prize essay. These include not just the concept of expanding existing towns rather than building freestanding garden villages, but also ideas for land value capture, new forms of housing development such as custom build and self build and of course implementation vehicles such as Garden Town Foundations or Development Corporations.